Following the back-to-back loss of two key members of Melissa & her husband's family, the emotional upheaval and grief they experienced nearly broke them--both as a couple and within themselves. After compounding their shattered state by taking on the pain of others and trying to carry it for them, they were faced with a beautiful, yet difficult realization: they couldn't fix their loved ones broken hearts, they could only create their own path toward healing and wholeness. Within this time, Melissa helped to gather and lead a group of her loved ones through a private support group meeting. The healing and connection she experienced in this session drew her into immersing in leading-edge wellness modalities such as meditation, mindfulness, yoga and intention-setting. A self-taught voracious student of Barbara DeAngelis, davidji, Deepak Chopra, Brendon Burchard, Gabrielle Bernstein, Danielle LaPorte and several others, Melissa created her own daily practice along with her husband. They are now devotees of meditation and stress management tools. Since then, they've created a peaceful life and Melissa has dedicated her time to helping others regularly rejuvenate and care for themselves so that they can contribute more powerfully to their families and communities. 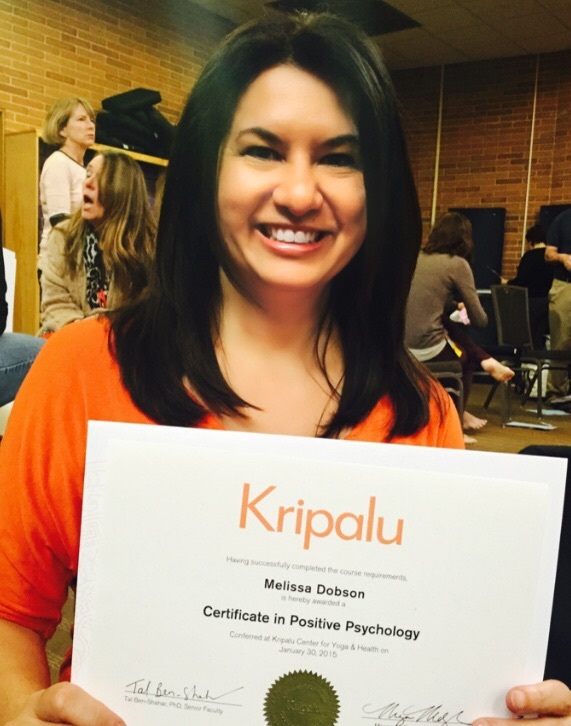 Melissa is certified in Positive Psychology via Wholebeing Institute and has received training in stress reduction, traumas of law enforcement and living a wholehearted life.